Lancashire have announced a profit of £793,000 for the 2014 financial year. It is a drop on 2013's £3.5m profit, although that year their Old Trafford ground hosted an Ashes Test match. A £45m regeneration of the ground has enabled the club to make a profit two years in a row after previously reporting four years of losses. "We're generating positive cash flow and making profit, so we're going in the right direction," said finance director Lee Morgan. Lancashire say the India Test match, a one-day game against Sri Lanka and attendances at T20 games also helped. "It's nice to see a continuation of profitability has come back to the club. Having said that, there is still the legacy of those losses to overcome," Morgan told BBC Radio Lancashire. 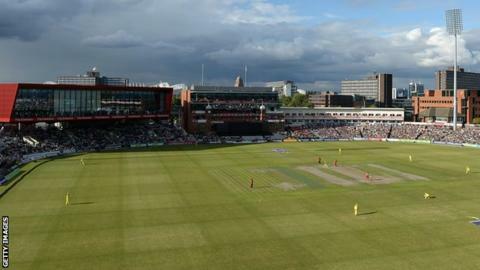 Later this summer, Old Trafford will host two one-day internationals against World Cup winners Australia as well a game against losing finalists New Zealand. The Red Rose county will also begin work on a £12m, 150-room four-star hotel after raising £3m in bonds last autumn, which will be completed by 2017. Former England spinner Ashley Giles was appointed new cricket director and head coach this summer after the club were relegated to Division Two of the County Championship.